Houston is the most diverse, rapidly growing major U.S. metropolitan area, and immigration has contributed greatly to its growth and diversity. In 2013 the Houston metro area was home to 6.3 million people, of whom 1.4 million were foreign born—an increase of nearly 60 percent from 2000, which is almost twice the national growth rate. Its immigrant population ranked fifth largest among U.S. metropolitan areas and third in the numbers of Mexican, Vietnamese, and Honduran immigrants. By the time of the 2010 Census, Houston's population did not have a majority racial or ethnic group: non-Hispanic whites represented 40 percent of the total population, Latinos 36 percent, Blacks 17 percent, and Asians 6 percent. 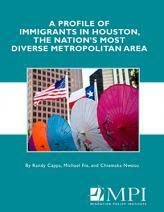 This report provides an overview of the demographic and socioeconomic characteristics of Houston's immigrants, along with their naturalization rates, legal status, and potential eligibility for immigration benefits such as citizenship or the Deferred Action for Childhood Arrivals (DACA) program. The report finds that Houston's strong labor market and growing economy provide a solid foundation for the integration of immigrants and their children. At the same time, Houston has a relatively low-wage economy, and the low incomes of Houston's immigrants—particularly Latinos—may present barriers to their integration and access to legal assistance, health care, and other needed services. Using data from the American Community Survey (ACS), the authors tabulate numbers of immigrants potentially in need of community-based immigration assistance. The report finds that an estimated 350,000 legal permanent residents, most of them from Mexico and Central America, are eligible for naturalization but have not yet applied. In addition, nearly half of the metro area's 400,000 unauthorized immigrants are potentially eligible for either DACA or the Deferred Action for Parents of Americans and Lawful Permanent Residents (DAPA) program.